Paul Mueller is a Bassmaster Elite Series Professional Angler and a Freshwater Multi-species Guide in the state of Connecticut. With over a decade of fishing experience on lakes in the state, Paul can help you become familiar with some of the finest freshwater fishing Connecticut has to offer. Fish comfortably from a tournament rigged Phoenix 921 Pro XP Bass Boat. Make sure to inquire about the different boat options if you have a large group of people. Depending on the number of people, Paul can provide the right boat for the outing. Paul supplies all gear necessary for the trip. Experience the thrill of catching the most underrated freshwater gamefish in Connecticut on Lake Lillinonah. A typical days catch ranges from fish 10 to 20 pounds with 25 -30 pound fish a possibility. Come explore one of New England's bass fishing gems, Candlewood Lake. Whether you 're after Largemouth or Smallmouth Bass, Paul will teach you the latest techniques from the tournament trail that will improve your success for years to come. A typical days catch consists of bass ranging 2-4 lbs. with 4 1/2lb. plus smallmouths and 5 lb. plus largemouths common. Fall is one of the best times of the year to take advantage of Connecticut's premier crappie lakes. Paul will teach you how to locate these large schools of fish, interpret your electronics, and show you the techniques that are the most effective to put fish in the boat. 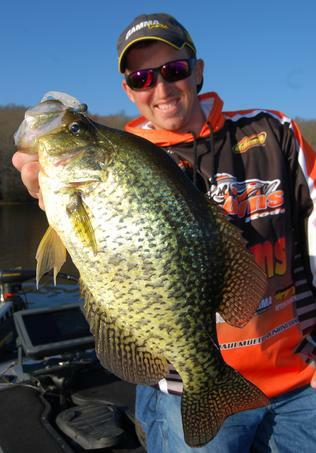 There are a few lakes in CT that have an abundance of Black Crappie ranging from 10-16" During the Ice season, you can find these fish in the largest concentrations all year long. Paul supplies your own personal Vexilar flasher as well as jig rods and tackle for the day. Candlewood Lake has world class Yellow Perch Fishing. There are an abundance of 11-15 inch Perch in the lake. Ice Fishing trips are available.